This article is about the video game. For the PBS game show, see Where in the World Is Carmen Sandiego? (TV show). 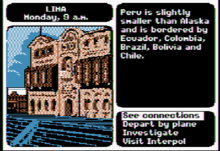 For other uses, see Where in the World Is Carmen Sandiego? Where in the World is Carmen Sandiego? is an educational video game released by Broderbund in 1985. It is the first product in the Carmen Sandiego franchise. The game was distributed with The World Almanac and Book of Facts, published by Pharos Books. An enhanced version of the game was released in 1989, which did not have the almanac copy protection but disk based copy protection. A deluxe version was released in 1992, and featured additional animation and a reworked interface from the original version. Some of the bonus features include: "digitized photos from National Geographic, over 3200 clues, music from the Smithsonian/Folkways Recordings, 20 villains, 60 countries, and 16 maps". CD-ROM versions for MS-DOS and Macintosh were released in 1992, and a Windows version was released in 1994. In the game, the player takes the role of a rookie in the ACME Detective Agency, tasked to track down crooks from the V.I.L.E. organization that have stolen famous works from around the world. They do this by using their knowledge of geography (aided by the Almanac) to question witnesses or investigate clues to track down where the crook has gone. Successfully solving these crimes increases the player's rank in ACME, leading to more difficult cases and later tasked to find the lead of V.I.L.E., Carmen Sandiego. The game was initially developed as a menu-driven interface to replace the text-driven interface of adventure games like Colossal Cave Adventure for graphic-enabled computers like the Apple II. Along the way, the idea of introducing geography as part of the game and distributing the Almanac with the game shifted its approach. While it was not intended as an education game at release, the game proved very successful as an education tool for schools. By 1995, over 4 million copies of the game had been sold, and established the Carmen Sandiego franchise. The game was later adapted into a PBS game show that ran from 1991 to 1995. This game is not to be confused with the 1996 rebooted version sometimes mistakenly called the "Deluxe" version. The goal of the game is to track down Carmen Sandiego's villains around the world, arrest them and later capture Carmen herself. The player begins the game by first going to the country where the crime took place and then obtaining hints from various sources on where the thief went next, leading to a chase around the world to find the thief before time runs out. Each case begins with the user being alerted that a spectacular theft has been committed. Starting by first traveling to the scene of the crime, the player is given several opportunities to collect clues about the suspect's next location, which come in the form of pun-filled word play about the target place. There are thirty countries that can be visited in the game and each is identified by the name of a prominent city, though this city is not always consistent with the image of the country shown in the game. A screenshot from the game, showing the options to the player at a given location. Carmen Sandiego's interface was designed as a graphic menu-driven adventure game to remove the ambiguity of previous text adventure games. If the player travels to an incorrect location, they receive nonsensical clues and will have to backtrack to the previous location to try again. If the player travels to the correct location, a simple animation of an obvious, but otherwise harmless V.I.L.E. henchman lurking across the screen is played. The gameplay continues to repeat in this manner as the player travels from location to location several times before catching up to the criminal. The user has only a limited amount of in-game time to travel, collect clues, and apprehend the criminal; every action taken uses up a portion of this time, and the criminal escapes if it runs out. Occasionally, a witness will give a partial description of the criminal, allowing the user to eliminate one or more V.I.L.E. members as suspects. When only one viable suspect remains, Interpol issues an "arrest warrant" (the in-game equivalent of an Interpol "Red Notice") against that individual. If the user enters a combination of attributes that eliminates all possible members of the database, the game will inform the user to that effect and refuse to issue any warrant. Once the user reaches the final destination (indicated by witnesses warning the user to be careful) and chooses the correct location, the police chase the criminal across the screen, leading to an off-screen fight. If the user has obtained a warrant for the correct suspect, the police place the criminal under arrest and the case is closed. Otherwise, the police are left empty-handed and the criminal escapes. The user becomes eligible for promotion after solving enough cases. Before the new rank is granted, though, the user must correctly answer a geography question with the help of a reference book included with the program (used as a form of protection against disk copying). Each rank gives harder assignments with more potential locations to visit. The culprit in the final case is Carmen Sandiego herself; apprehending her earns the user a spot in the game's Hall of Fame. The Master System version plays quite differently compared to the other versions. Instead of using a menu-based system, a sprite character representing the user can be moved to the respective buildings within a country, to get a warrant or back to the airport to travel. The user must duck or jump knife attacks from henchmen and gun attacks from Carmen's gang, and will lose some time recovering if hit. Where in the World is Carmen Sandiego? Deluxe, on CD-ROM, adds digitized photographs from the National Geographic Society and music from Smithsonian/Folkways. Each location contains three sources of clues: The user can question a bystander, search the area, or call "Crime Net". Bystanders and "Crime Net" provide clues as to the suspect's location and, on occasion, additionally state something about the suspect. Searching an area along the perpetrator's path turns up an object that provides a clue as to the suspect's location. The Deluxe edition is the first in the series to feature dialogue spoken aloud, although most information still appears in written form and the dialogue of bystanders is not spoken but rather contained in speech balloons. The conception of the game began in 1983, though it did not start off as an educational game. Broderbund programmer Dane Bigham had played the text adventure game Colossal Cave Adventure, but found that players would struggle in trying to find the correct synonyms to use for the commands programmed into the game, a limitation of computational power at that time. With the Apple II home computer gaining popularity, Bigham believed he could write an adventure game for children, using the graphics of the Apple II to provide menu-driven commands to replace text commands. Bigham developed the game to a point where it contained enough locations and concepts to take it to Broderbund's "Rubber Room", the offices of Gene Portwood, a former Disney artist, and Lauren Elliott, as to start developing a more complete story and art for the game. Bigham's initial idea, based on the childhood game of cops and robbers, did not readily get Portwood's attention, but as Bigham pared down the concept, in particular focusing the game on catching one criminal at a time rather than multiple, Portwood warmed up to the idea. As Bigham, Portwood, and Elliott worked on this approach, Broderbund co-founder Gary Carlston suggested changing the game from an adventure to one focused on geography, recalling his own travels as a child in Europe in the 1950s. Bigham was not as thrilled with this idea, but continued on with the game focusing on refining the game's interface. To help write a narrative, Carlston hired in David Siefkin, and initially suggested to write a narrative around the Great Cities works from Time-Life Books, but later directed him to use the World Almanac, as Carlston had plans to ship the game with the Almanac with it. Siefkin wrote an early script for the game beside the swimming pool in Strawberry Canyon on the campus of the University of California at Berkeley. Siefkin was also inspired by Colossal Cave Adventure, transforming the cavern into a map of the world, where the rooms of the cavern become countries with real treasures, and the clues were based on the languages, culture, and geography of those countries that they could get from the Almanac. In the initial script, the game would select a random villain and a stolen treasure, and start the player in a randomly-selected city with a clue of where to go next via Bigham's menu interface. Getting the right answer would give the player another clue to the next location, and this process would repeat five to six times until the villain was caught and a new game started. Siefkin believed that children would learn about the world through trial and error as they played the game. Broderbund approved of this idea for the script and incorporated it into the existing development. Siefkin left the project soon after submitting the script to become a foreign service officer, serving as a diplomat in several of the countries featured in the game. He is listed in the game manual as a contributing author. In an early draft named World Quest, to be based upon the World Almanac and Book of Facts, the villain was a "demented and fabulously wealthy former professor" named Professor Estaban Devious. He would steal treasures from small countries and hide them in his Secret Museum. Siefkin's script featured several villains, one of whom he named Carmen Sandiego. Siefkin adapted Carmen's name from the Brazilian singer and actress Carmen Miranda, as well as the name of a dog owned by his former roommates in San Francisco, as well as from the American city of San Diego, California. Project manager Katherine Bird latched onto that name believing it captured something exotic and mysterious. She was described in the original game manual as "An agent, double agent, triple agent, and quadruple agent in so many countries that even she has forgotten which one she's working for." Carlston also liked the name as they could design a female character for it, allowing young women to be able to connect with the game, as well as not having to worry about her backstory of why she became a crook. The name also lended well to the title Where In the World Is Carmen Sandiego? as it succinctly informed the player of the game's goal. With this, they fleshed out two organizations: V.I.L.E. - Villains' International League of Evil - and the ACME Detective Agency - with ACME joking considered an initialism for "A Company that Makes Everything". Some of the villains in V.I.L.E. 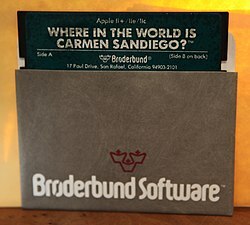 were designed from other Broderbund employees: Carmen was modeled after Marsha Bell, the company's manager of marketing services, while the villain "Katherine Drib" was an anagram of Bird's name. Others were named based on puns, such as "Ken U. Sparadigm" for "can you spare a dime". The game would now require the player to start as a recruit for ACME, and work their way up by locating the henchmen within V.I.L.E., until finally they were ready to track Carmen. As they worked their way up, they would have less in-game time to find the crook, and the geographic trivia would become harder. Bigham considered his relationship with this first Carmen game as one of "love-hate", as he had been more inspired to develop action games, and Carlston had denied him opportunities to work on these at Broderbund while Carmen was still in production. Bigham was still not sure if the game would be successful, and once the game was complete by 1985, took a brief leave from Broderbund to work with Douglas E. Smith during that summer. When he returned to Broderbund, he was surprised that Carmen was popular from a market area they did not anticipate, that being from an educational standpoint, becoming a core piece of software in many schools. Where in the World is Carmen Sandiego was Broderbund's third best-selling Commodore game as of late 1987. Sales surpassed 250,000 copies by November 1989, more than two million by 1991, and more than four million by 1995. In 2003, Computers and Education wrote that Carmen Sandiego was "by far the best-selling educational software in North America". Compute! called Carmen Sandiego an example of Broderbund's "attention to detail", and added "that it helps teach research skills and fundamentals of geography as well seems almost too good to be true ... it's entertaining enough to disguise the fact that you might be learning something while you play". The magazine gave it the 1989 Compute! Choice Award for Educational Software, stating that it successfully combined teaching and fun. Info gave the Commodore 64 version four-plus stars out of five, describing it as "a really good educational game ... you'll hardly be aware that you've been taught. The graphics and gameplay are nice, too". GamePro gave the SNES version a positive review. They described it as identical to the earlier PC and Genesis versions, and praised the graphics and the strong edutainment value. The game was given a rating of 4 out of 5 at MyAbandonware. In April 1994 Computer Gaming World said that the Deluxe CD version "adds substantial value to an already excellent game". The San Diego Union said the "'Carmen Sandiego Deluxe' game is challenging, but still fun", adding that "Kids will be anything but bored". Boston Globe said it was "for older children". Pittsburgh Post-Gazette described it as a "fast paced detective chase". The Los Angeles Times said "[Carmen Sandiego's] creators at Broderbund have remade her bigger and badder than ever in a terrific new CD-ROM release of "Where in the World Is Carmen Sandiego? Deluxe Edition", and gave the gave a rating of 5 out of 5 stars. The game was given a press score of 6.3 off IGN, and a Reader Review Average of 8.0, a GameFAQs Rating Average of 8.5, and a GameRankings Average of 6.2 off the website GameFAQs. Nintendo Power gave the game a rating of 3.075 out of 5. A review of the 1992 version of Where in the World Is Carmen Sandiego? by Gary Hartley for HonestGamers concluded by saying: "For the most part, this is a good game. It has its share of flaws, but you should find it above average overall". Hartley gave the game a score of 6/10 (Good). 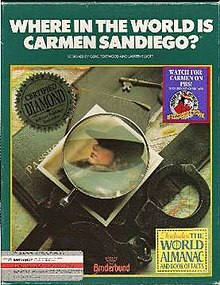 Carole Stewart McDonnell for the website Guide2Games gave a positive review for the 1992 version of the game Where in the World Is Carmen Sandiego?, saying "this is a fun way of learning world geography". The game was given a Christian Rating of 5/5 (nothing offensive), a Gameplay rating of 5/5 (excellent), a Violence rating of 5/5 (none) and an Adult Content rating of 4/5 (barely present). A 5¼-inch floppy disk for the Apple II Plus personal computer. This is a list of the thirty locations visited in the game, organized in alphabetical order by country. Note that cities are identified as they were in the game and that they are followed by the country that the city would have been located in at the time the game was produced. ^ "Where in the World is Carmen Sandiego? (Deluxe Edition) for PC - G4tv". ^ "Eugene Register-Guard - Google News Archive Search". ^ In later games, "Crime Net" would be written as "Crimenet". ^ a b c d e Craddock, David (September 15, 2017). "The Making Of Carmen Sandiego". Kotaku. Retrieved September 15, 2017. ^ Cifaldi, Frank (2014-05-29). "WOW. Early ideas for what eventually became Carmen Sandiego, dug up at @museumofplay. She was "Esteban Devious."pic.twitter.com/OJOl6I6nIM". @frankcifaldi. Retrieved 2018-12-30. ^ Rabinovitz, Jonathan (1991-10-06). "TELEVISION; The Case of the Game-Show Ploy". The New York Times. ISSN 0362-4331. Retrieved 2017-11-25. ^ "That's Edutainment". Billboard. Nielsen Business Media. 107 (19): 91. May 1, 1995. ISSN 0006-2510. Retrieved August 8, 2009. ^ McCullough, Karen G. (February 1986). "Where in the World is Carmen Sandiego? For Apple". Compute!. p. 47. Retrieved 8 November 2013. ^ "The 189 Compute! Choice Awards". Compute!. January 1989. p. 24. Retrieved 10 November 2013. ^ "Where in the World is Carmen Sandiego? (Deluxe Edition)". ^ "Children's educational software still an exploding market". ^ "Los Angeles Times: Archives - Globe-Trotting Gangsters". ^ "IGN: Where in the World Is Carmen Sandiego?". Au.cheats.ign.com. Retrieved 2011-02-03. ^ Search:. "Where in the World Is Carmen Sandiego? for SNES". GameFAQs. Retrieved 2011-02-03. ^ "Where in the World Is Carmen Sandiego? for SNES". GameRankings. Retrieved 2011-02-03. ^ "Where in the World Is Carmen Sandiego? review (Genesis)". HonestGamers. 2009-03-20. Retrieved 2011-02-03. ^ "WHERE IN THE WORLD Is Carmen SANDIEGO? | a game review from Christian Spotlight". Christiananswers.net. Retrieved 2011-02-03. This page was last edited on 14 January 2019, at 14:12 (UTC).